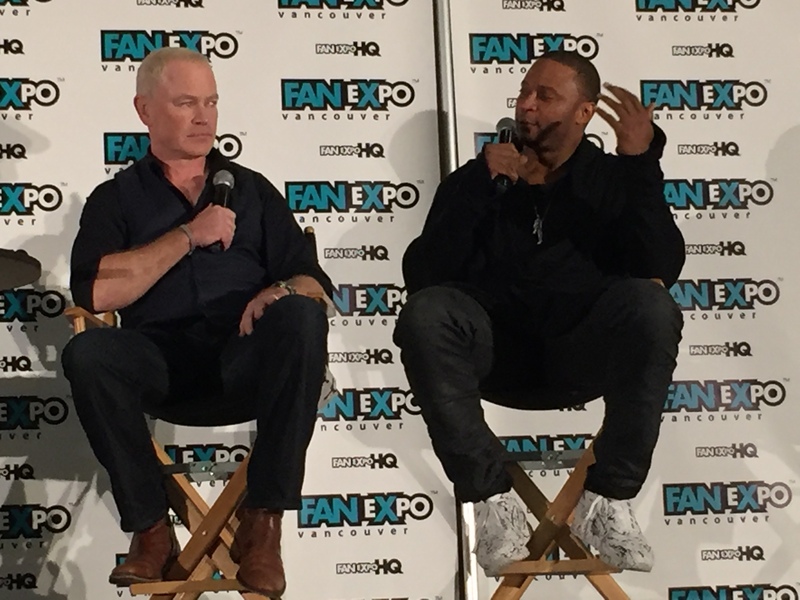 During Fan Expo Vancouver 2016, Arrow’s David Ramsay and Neal McDonough (who is also appearing on DC’s Legends of Tomorrow) talked about somethings we can expect on both shows. One of the biggest revelations is that McDonough mentioned is that we are going to see Damien Darhk appear in the 1920s, 1960s and 2025 on Legends. The latter is interesting considering that Oliver kills Darhk in 2016 so did Sara change his fate when she spilled how and when he is going to die? Over on Arrow, Ramway said the show will focus more on the Original Team Arrow (Oliver, Diggle and Felicity) but the recruits aren’t going away and he hopes that the team will add some more feminine energy than just Felicity and Evelyn. In addition, Ramsay said that Diggle and Felicity will help Oliver become a better hero while we will see more of Lyla being the new Amanda Waller as the head of ARGUS. Ramsay also shared that Diggle’s new helmet, a STAR Labs, creation can do cool things and we are going to love his reaction to Supergirl during the upcoming cross-over. In a separate panel earlier in the day, Arrow and DC’s Legends of Tomorrow’s John Barrowman spoke about what’s upcoming for the Legion of Doom that is comprised of his Malcolm Merlyn, McDonough’s Damien Darhk, Matt Letscher’s Eobard Thawne/Reverse-Flash and Wentworth Miller’s Captain Cold. Barrowman talks about filming a scene for an upcoming episode that will feature him and McDonough and Reverse-Flash (he didn’t quite say Reverse-Flash) calling their Legion of Doom episode really fun. “The two most evil men in the Arrowverse have a sense of humour, a really sick sense of humour,” he added.